While out overseas to attend and perform at the 2015 Brit Awards, Kanye West cleared forty minutes in his schedule for an interview with Zane Lowe on BBC Radio one. The sit down comes a year-and-a-half since their last chat and fewer than every week since Kanye appeared on Power 105′s The Breakfast Club. 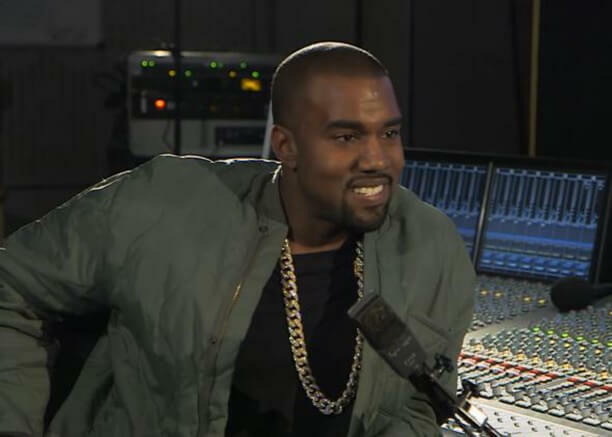 A variety of topics were mentioned in Kanye West and Zane Lowe’s second meet. The Chicago rapper honestly spoke on his coming seventh solo platter, Drake, The Grammy’s, operating with paul mccartney, wanting another baby, ‘Blessings’ with big Sean and Drake, ‘Only One’, and more. At one purpose, Zane is forced to pause the interview as ‘Ye begins to interrupt down and cry over the late fashion prof Louise Wilson. No release date for Kanye’s new album simply nevertheless however should not be too long currently as he recently debuted ‘All Day’ at the 2015 Brit Awards and performed ‘Wolves’ on Sabbatum Night Live. Watch the interview below. I don’t have any advice for this young man, but what I can say is, ‘Run. Fly. Go as fast as you can. Don’t stop. Any time I can be of any service, advice, whatever you need—confidential design advice, shoes you’re doing over at the other company—anything we can collectively do to deliver more awesomeness to the world, as a team.